I didn’t get the opportunity to start skiing until I was out of high school. I had never been on skis, but I went along with some friends who were seasoned skiers and did what they did. I got the same lift ticket. I got the same skis. I rode the cool high speed quad with them and I went towards the same Double Black Diamond trail they did. I followed them down. I got something none of them got – a trip to the First Aid Station. I also had road rash on my face that was so bad it looked as if I were hooked to the bumper like poor Dinky and dragged for a few miles. I eventually taught myself how to stay up, how to move and turn, how to stop, and how to have fun. I loved it and went any chance I could get. Life got busy and skiing got pushed off. Lily got a small taste of skiing a few years back when we did a family trip to Liberty Mountain and has been itching to try it again. I was looking for something to do for our Daddy-Daughter date night and suggested skiing. She was so excited and ready to go. I left work a little early, picked her up from school and we were off. She only been skiing that one time, which she barely remembered, so we were basically back to first time skier. Time for me to teach her, but no worries, it’s quite simple. First thing you want to do is have them bundled up pretty good. A one piece snow suit works really well because it doesn’t allow snow to go down their pants. Good winter gloves that allow their fingers to move and grip and a thin hat that will fit under the helmet. Another thing you’ll want to have for them is ski goggles. I’ve gotten her used to wearing goggles by allowing her to use them to play in the snow at home. Without them, kids will be squinting and have a hard time concentrating on what they’re doing. Ski resorts don’t rent goggles, so you’ll have to bring them with you or buy them at the lodge (if they have them). I found hers at a spring clearance sale for pennies on the dollar at a local ski shop. Next, you’ll get the rental items: skis and a helmet. Kids do not need poles, they’ll just be a distraction. Talk to the ski rental techs to get the proper length ski for them, as well as have the bindings set to an appropriate level. Err on the side of an easier release because you can always go back and have them tightened. You’ll also need to think about rentals for you, even if you have your own skis. You’ll want a shorter ski than you normally use. If you’ve got the kids with you, you’re probably spending the day with them and not doing high speed runs, moguls, or jumps. I’d suggest at least shortening your skis by about 20 cm. For example, I normally ski with a 170 or 180, but when I’m working with Lily, I use a 150. This allows me more control and to go slower and not have to work too hard to plow, since that is what you’ll be doing most of the time when beginning to teach them. You’ll want to get one ski pole, not two, and you’ll want it to be the largest one they have. 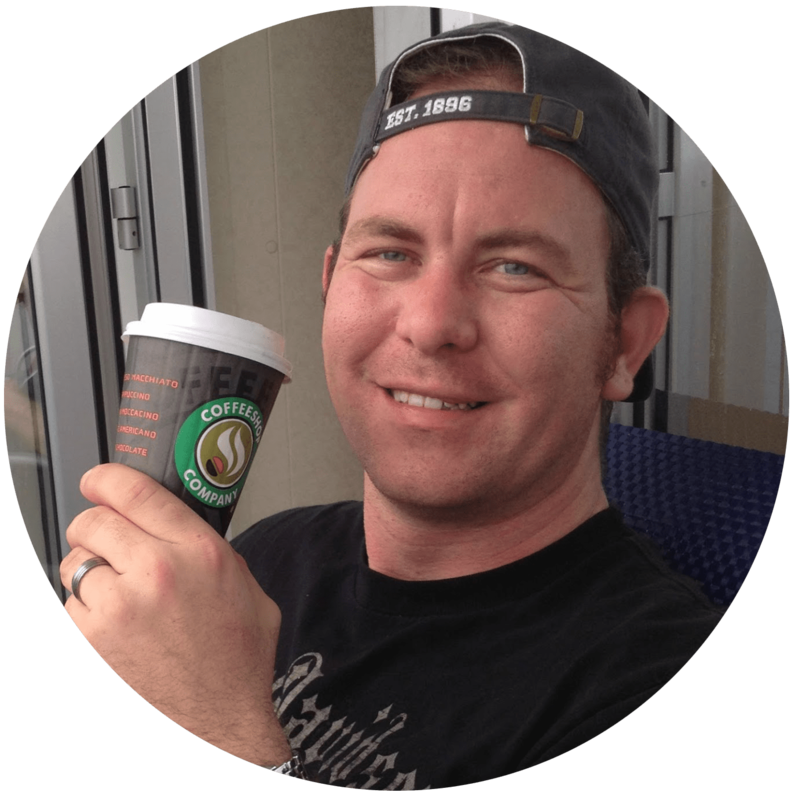 It is going to be a teaching tool, not a comfort tool for you. Now, I can’t take credit for the technique I’m about to try to tell you about. 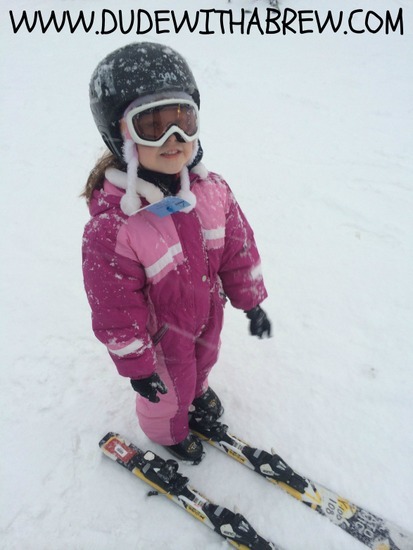 When we took that family trip to Liberty Mountain a few years ago Lily and I took a “Ski with Me” private lesson. If you’re at Liberty or any place that offers it, take it. If you’re at Liberty and Tim is still there, REQUEST HIM. He was awesome. He taught ME to teach her. The concept, in the most basic form, is using the ski pole to balance them, aim them and control their speed. You’ll have to find out what side you are most comfortable having them on. For me, having her on my left works well. I can control her with the pole in my right hand, but use my left hand to grab her jacket if needed. Position: Hold the ski pole with the point end in your hand, horizontal, with the handle end in front of them. In the picture below, you’ll see I have two poles, which can be done, but it is much easier to use one, so leave the second at rental or in the car. Hold the pole so they can grab it by putting their hands in front of them slightly. You want them to balance on their own and use the pole as a guide. Start off on the flat at the bottom of the beginner slope. Get them use to cross county sliding across the snow. Move one ski, stop it, then move the next. Lily wanted to keep moving one forward as the other went back in some sort of flailing foot dance. Work on getting them to plant one foot, THEN move the next. Try not to let them pull on the ski pole, they need to be able to move on their own. As they get the movement down, their balance will improve. Keep working on this until they can do it mostly on their own. They’ll need to be able to do this fairly well to be able to get on and off the lift. To start skiing: You’ll want to move up the beginner hill a little. You want just enough slope to get them moving, but not so much that they can gain speed. You can walk up the hill a little to do this or if you are somewhere like Liberty, you can use the Magic Carpet. The Magic Carpet is basically a moving sidewalk like those at the airport. (Talk to the attendant to find out the proper way to assist your child up the carpet). You’ll have to decide when they are stable enough to get on the chair lift. The biggest thing with the chair lift is the small, quick downhill when exiting. It’ll be tricky until they get use to it. Continue to use the ski pole to control them. Start off by getting them used to moving downhill. Keep their skis straight and close together, knees slightly bent and trying not to put their weight on the ski pole. Work on this until they get comfortable and then progress to slight snowplowing. Lily is obsessed with geometry, so we called it “little triangles.” They’ll be looking down a lot until they get the feel for it, so be prepared to hold a little more of their weight on the ski pole, but still try to discourage it. You can tell if they are getting it down by how much you have to slow them down with the pole. After they’re comfortable with this, progress to more of a slope and work between straight and little triangles while gaining a little speed. Keep the ski pole in front of them and use it to steer them. When they get this down, start working on plowing to a stop, or big triangles. Work on this until they get the concept of stopping without crossing their skis. Okay, the basics are down. We are ready to start moving a little more independently. This is nothing more than holding the ski pole out in front of them. Use it to catch them as they get wobbly or get going too quickly (they can pick up speed really quick, so be ready). Work on independently moving forward (you can regress back to a lesser slope, but with the focus on not holding the pole). Follow the same progression. Straight skiing, slight snowplow, increase speed and snowplow braking. Continue side by side with the pole there to assist them. Steering is difficult to teach, but we seemed to do well with opposites. Push weight on the right leg to go left, and push weight on the left leg to go right. Slowly let them get a little further from you. They’re going to fall, but it’s all part of it. I prepared Lily for this in the car and told her it’s par for the course. We also looked at skiers and snowboarders as we went up the chair lift to see how many have fallen, just to reinforce that it’s normal to fall. Helping them up is fairly easy as well. When they fall, get them to get in the habit of positioning themselves to get ready for help. Head up hill and skis downhill pointing to the left. I had her lay on her back and put her feet up if she couldn’t quite get there, and spun her like a top. Get on the downhill side of them, skis close and parallel, then simply pull them up. Every once in a while I’d have to just grab her by the jacket and lift her up. I’ve never used the bungee cords, and putting them in between your legs gives you no control at all (plus if you fall, you are guaranteed to fall on them). The method I described above has been the easiest way to get her to learn to ski on her own. You can progress to independent as quickly as they are ready, but if there is a problem all you need is the pole you probably already have. They’ll know what to do from there. After you are done for the day be sure to tell them how good they did and make light of any wipe-outs. It is supposed to be fun and for me, it was. I even had to drag her off the mountain at closing time, because she just wanted to keep going. For local readers, this ski trip was at Spring Mountain in Schwenksville, PA. It is fairly close to us and while the slopes aren’t necessarily going to challenge an Olympics-caliber skier, it was perfect for learning and teaching. Bonus – lift tickets are discounted everyday after 4 pm. Here’s a quick vid of Lily’s first solo trip down the bunny slope. This came after about 2 hours of practice. 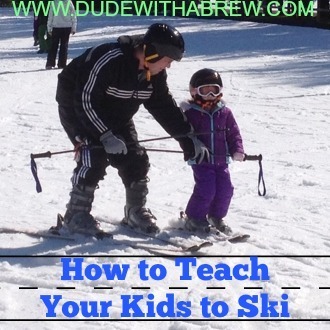 Have you ever tried to teach your kids to ski? Any other tips or techniques that worked well (or that we should avoid! )?